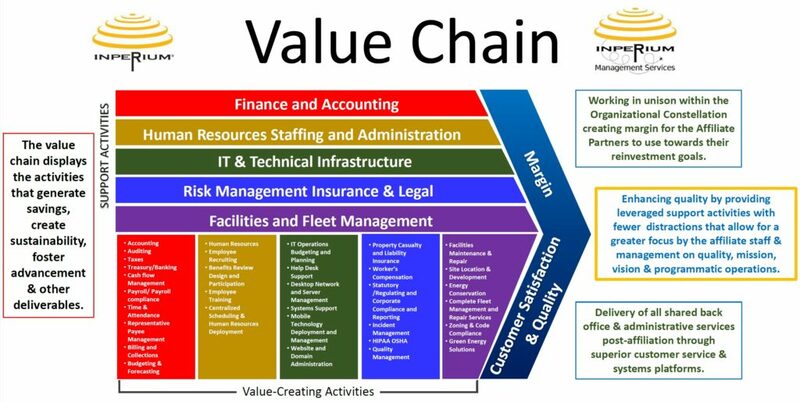 A unique strategic alternative affiliation model to achieve business combinations. These “business combinations” have been necessary in an environment that has become more challenging for nonprofits to obtain the financial support needed to advance their missions. Inperium, Inc. was founded in January 2016. It is a Pennsylvania non-profit corporation headquartered in Reading, Berks County, Pennsylvania. Inperium is the sole member of non-profit agencies that provide substance abuse services, mental health, intellectual disability, and other health-related supports and services. Inperium was established to support and oversee its affiliated companies to assure that quality services and continuity of care are consistently provided to all individuals in a way that makes efficient use of available public funding. Inperium, Inc., is governed by a Board of Directors comprised of its Officers and independent members of the communities served by Inperium’s affiliated companies. Company Legal Entity Org Structure please click here. The logo for Inperium, Inc. suggests that our world is imaginative and comprised of many layers, full of the numerous prospects, associations and connections that need to be practical, poised and all working in synchronization if our utility is to be meaningful; translated in Latin the meaning of the word Inperium represents command, mastery & order. 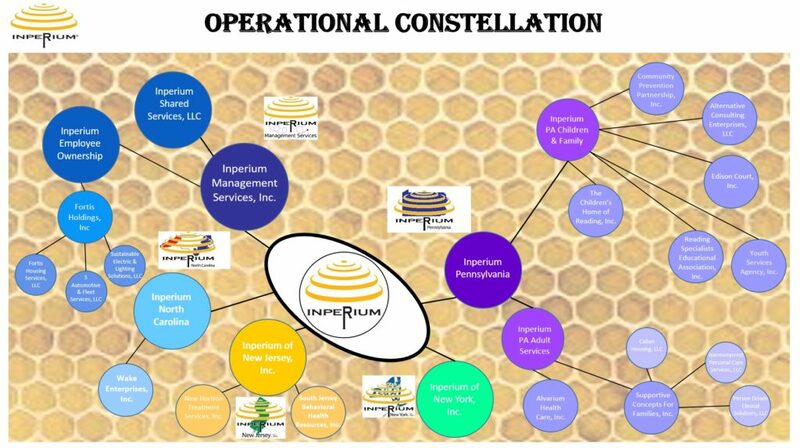 The need for this utility is represented with the abstract rings creating a realm that calls to mind a hive, galaxy or collection all working in unison with the fulcrum of the logo represented by the abstract functioning as the unifying support axis reflecting the stability, forte and coordination that Inperium, Inc. brings to its affiliated organizations. The word Inperium is the foundation on which the realm is situated & acts as the asset that supports the logo. This foundation provides the organizations it supports to function at their highest levels of productivity and meet whatever systemic challenges are encountered. In recent years, there has been an increase in mergers, asset transfers, and affiliations involving nonprofit organizations. These “business combinations” have been necessary in an environment that has become more challenging for nonprofits to obtain the financial support and fiscal compliance needed to advance their missions. The process for pursuing a nonprofit business combination, including use of letters of intent or term sheets, due diligence, and the negotiation and execution of documents to effectuate the combination, is very similar to the process used with for-profit entities. Nevertheless, business combinations involving nonprofits have important differences from their for-profit counterparts because of the unique nature of nonprofits. An initial step in any business combination is determining whether such combination will advance the nonprofit’s mission. The factors that a nonprofit board needs to take into consideration in such evaluation are very similar to those factors a for-profit board considers, including the prospects for future growth, enhancements to service quality, opportunities for cost savings and other efficiencies to be obtained through the combination, and work force issues. Moreover, the fiduciary duties imposed on nonprofit directors in acting on business combinations are very similar to the fiduciary duties imposed on for-profit directors. Still, there are some important differences between for-profit and nonprofit business combinations because nonprofit trustees do not have an ownership interest in the nonprofit. The differences between for-profits and nonprofits lead to other unique factors that need to be considered by a nonprofit board when evaluating a possible business combination. While nonprofit corporations differ from for-profit entities in that nonprofits have no owners, a parent-subsidiary structure can still be structured with nonprofits. The main difference is that the “parent” nonprofit does not own any shares or other interest in the nonprofit. Instead, it is treated as the parent because of the stannding it has over the other nonprofit. This is typically accomplished as a result of the “parent” nonprofit becoming the sole voting member of the “subsidiary” nonprofit, with the right to determine the directors of the subsidiary nonprofit. The arrangement, typically referred to as an affiliation, can be accomplished by amending the articles of incorporation and bylaws of the “subsidiary” nonprofit. Because this type of combination or affiliation is similar to a merger or acquisition of assets, parties often enter into an affiliation agreement that covers similar topics addressed in other business combination agreements. For instance, an affiliation agreement might address any change in activities of the subsidiary nonprofit as well as the composition of the parent’s board of directors as well as certain representations and warranties about the parties and their operations. One of the main advantages of a parent-subsidiary type structure is that the corporate existence of the subsidiary is maintained, the subsidiary board continues to function, and there is typically no need to relicense existing services or to pursue assignment of the subsidiary’s contracts. Similar to business combinations involving for-profits, due diligence activities are important for business combinations involving nonprofit corporations. Many of the considerations for a for-profit business combination are important in due diligence reviews involving a nonprofit business combination. These include reviewing various information and documents relating to the other entity, including its governance documents (such as articles of incorporation, bylaws, and board policies), financial information (including audited financial statements and any audit reports), contractual arrangements, real and personal property, litigation, insurance coverages, and workforce/employees (and employee benefits). The governing body of a nonprofit corporation defines the organization’s mission, establishes its goals, approves strategic plans, and authorizes major transactions. Fundamental corporate transactions such as affiliation present trustees with the possibility of a new and more effective path to mission fulfillment. While requiring committed effort to form and sustain, successful affiliations can increase the availability or types of programming, strengthen organizational capacity and quality, expand knowledge and connections, and enhance effectiveness through collaborative leadership, com­bined staff and volunteers, joint fundraising, and shared technology and facilities. Copyright © 2018 Inperium. All Rights Reserved.